They won’t be fighting, though, so it won’t be a clash. The Southwest Show on Saturday will see R-Comp Interactive unveil another new computer based on the TiMachine range (in turn based around the Titanium motherboard from Elesar Ltd). That new machine is called the Titan, and arrives in a tower case, similar in size to the launch version of the Iyonix according to R-Comp’s announcement. With a base price of £775 including VAT, the default machine is shipped with a single drive for storage, with additional options available, and ships with the same custom-written software as its older brother, though lacks the more elaborate “Bundle CD” of R-Comp’s commercial applications. 4D has announced a new IDE interface podule suitable for the Acorn-era hardware, providing a 40/44pin connection for rotating drives or, with a suitable adapter or interface, compact flash or SD cards. Called ZIDEFS, the podule’s features include support for up to four partitions, multiple podules (up to 3), Master and Slave drives, and more. ZIDEFS comes in several versions: IDE podule with 40 and 44pin male connectors, priced at £89.00; IDE podule with 40pin male and 44pin female connectors, £99.00; IDE podule with CF adapter and 2GB CF (as 4x512MB partitions), £149.00; IDE podule with SD adapter and a 32GB SD card, £149.00. 4D – the entity that shares space in the TARDIS with CJE Micro’s – is now offering 7″ and 10.” LCD monitors that feature multiple inputs, including HDMI, making them suitable for use in tight spots with small computers such as the Raspberry Pi. The combination of such a monitor, a Pi, and a small keyboard and mouse could also serve as a “portable desktop” computer. The 7″ monitor sports HDMI, VGA and 1V composite inputs. It features a native resolution of 1024×600, and is priced at £59 including UK postage. Meanwhile, the 10.1″ one has the same inputs, with the addition of USB, and its resolution is 1280×800. It is priced at £99.00 including UK postage. Saturday will be a Good Day to PiHard! There will be some new toys available from RISCOSbits at the London Show, which takes place on Saturday – new cases, docks for R-Comp‘s mini.m, and systems based around the Wandboard. In addition, the company’s website has been updated to reflect the new and existing range, with options to buy some items directly, rather than through eBay. Available in any colour you like, as long as you like bright green! The pi-top is a Raspberry Pi-based laptop that began its commercial life as a crowd-funded project in 2015, and CJE Micro’s released a RISC OS flavoured version in 2016 called the RapidO Top pi-topRO. Now that’s a solid state offer, if ever I saw one! From now until 8th October, 2018, Elesar Ltd‘s Titanium motherboard is available to buy with a jolly useful optional extra – a SanDisk 128GB solid state drive (SSD), pre-loaded with a standard RISC OS 5 disc image. In a situation that could have brought the economy stumbling to its knees, for a while there were no Econet Clocks in stock at 4D, having sold the last of the existing i-Cubed stock some time ago. However, the company is pleased to report that there is now a batch of new devices in stock and available to buy. That’s apparently pronounced “minim” which means I can’t make any Mini Me references. Um… like that one. Shortly before this year’s Wakefield Show, R-Comp teased us with the news that they had a small surprise in store for visitors to the show, which visitors soon discovered was a new, small computer – the mini.m. Based around the same processor as the ARMSX ARMX6, a quad-core Freescale i.MX6, the mini.m is for all intents and purposes a smaller version of the established machine – with some obvious differences due to its small size. Get a motherbook with a motherboard! 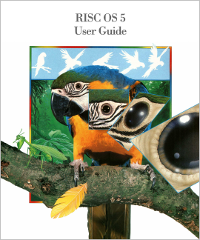 If you have been thinking about buying a Titanium motherboard from Elesar Ltd, you now have an additional incentive: The option of having a printed copy of the new RISC OS 5 User Guide included in the price – although, if you so choose, you can have the motherboard without the Guide. But size isn’t everything, you know. Honestly. In a pre-show tease, R-Comp‘s Andrew Rawnsley has posted to the RISC OS Open Forum to say the company will have something new at this weekend’s show – in a thread entitled “Good things come in small packages.” He goes on to explain that you shouldn’t be deceived by it’s small size, because this mysterious item – which he also describes as small, powerful, and shiny – packs quite a punch.